This week one of my favourite students emailed me from Korea and asked to interview me for a school project. Rachel really thinks like a writer (after all, she IS a writer) and so I was happy to answer all of her questions. Oh, by the way, the eleven-year-old in the title of this blog refers to ME. True, Rachel is technically eleven—though, if you ask me, she has the mind of a twenty-five-year old. (Do you know many kids in Grade 6 who casually throw around the word “flagitious?”). On the other hand, I’m often told that I’m emotionally stuck at eleven . . . so here you go—the candid and unedited interview . . .
BOREDOM. When I was a kid, growing up on the farm, I felt stuck. I dreamed of travelling to exotic (or magical!) places, but while all my friends were off having summer vacation, we were working hard on the farm. The work was okay—it was just that I was always bored, doing repetitive tasks like picking cherries or cleaning the chicken coop (which, by the way, is not only repetitive but repoopitive. Okay. Bad joke. MOVE ON.) In any case, I used to make up stories to entertain myself. Well, I also LOVED books. Everything about them. 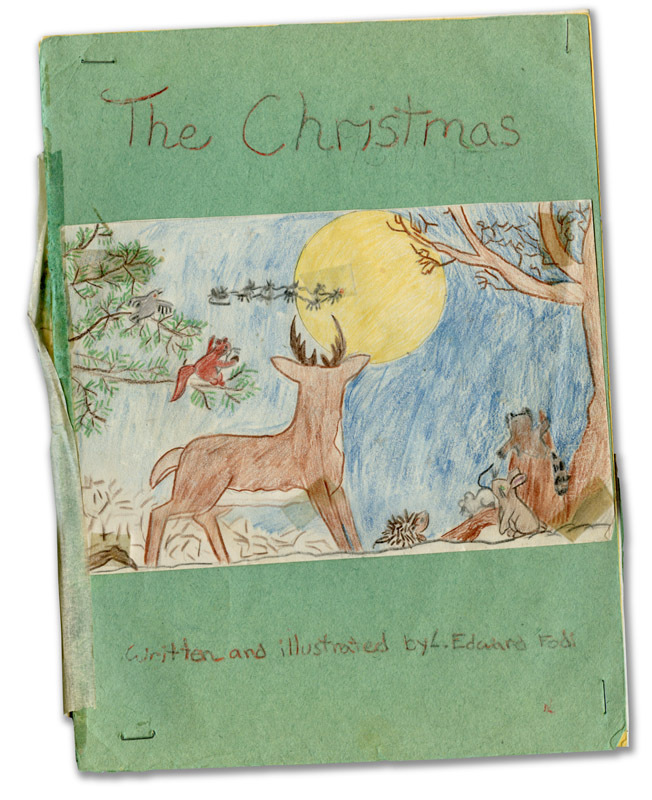 The stories, the illustrations, even the way the books were designed. So I started writing, illustrating and designing my own books. They looked terrible! But was not terrible was my love of books. And I guess that just continued forward as I got older. (Please notice how I didn’t say “Grew up”). 2) What do you feel is the advantage of being a writer? I have never had this question before, even though I’ve done quite a few interviews! I suppose I never thought of writing in quite this way. After all, many people will happily leap up and tell you all the DISADVANTAGES of being a writer (which seem to mainly consist of not earning enough money). I suppose I find this question difficult to answer because it makes it sound like someone has a choice when it comes to this career. And I feel like I did NOT have a choice. I am a storyteller. I didn’t choose it. When I was in university I listened to all the disadvantages that everyone was telling me and decided that I would abandon writing so that I could get a real job. And I did get a real job . . . But then I found myself scampering home each night to write anyway. I couldn’t stop writing! So, what is the advantage of being a writer? I guess the answer for me is not being a miserable person who decided to deny what is trying to burst out of his soul. By the way, there are many benefits to being a writer—I get to make up worlds and play in them. I get to travel the world and meet tons of children and hear THEIR wonderful stories. And I get to meet other authors, who are really some of the most interesting people in the world. 3) What do you believe is the mandatory preparations to be a writer? Read. A lot. And write. A lot. Read and write different sorts of books. Even if you are committed to a certain genre, reading and writing different styles ultimately makes you a better writer in whatever genre you end up choosing. (Though, sometimes, I feel like the genre chooses you). I’m a fantasy writer, so I believe you should cultivate creativity in your life. That’s why I build props, go on “field trips” to do research, and draw. Actually, as far as I’m concerned, all of these things are writing. When I’m drawing—I’m writing. 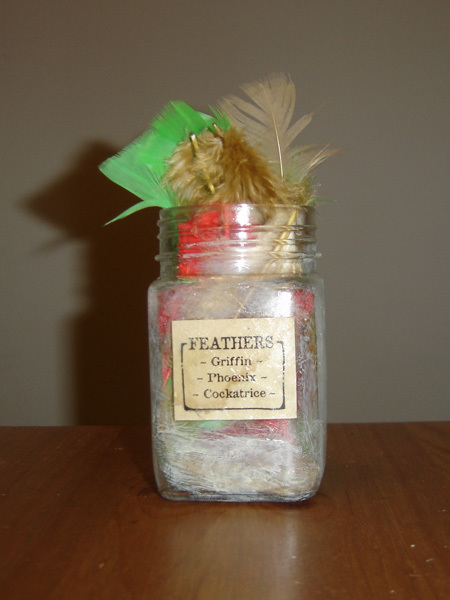 When I’m building my magic potions kit—I’m writing. 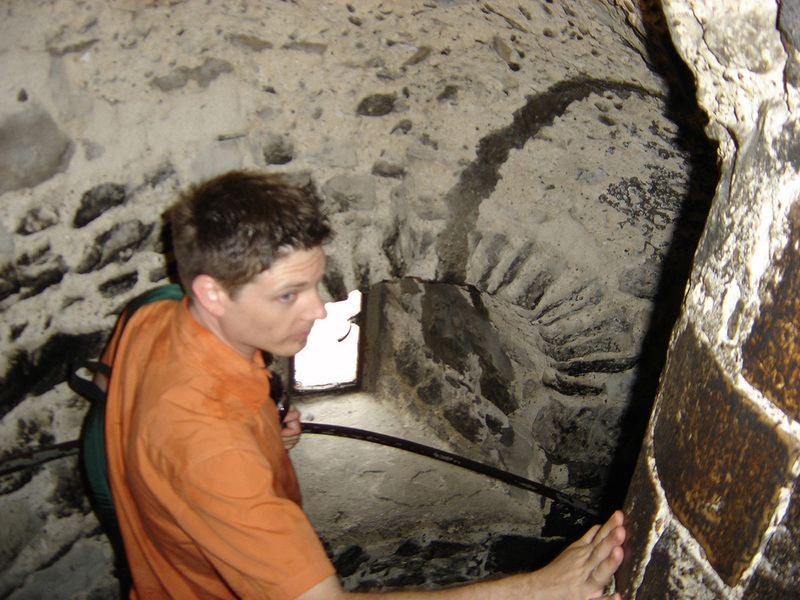 And when I’m traipsing through a castle dungeon and feeling a cold trickle of air down my spine—well, then, I’m DEFINITELY writing. 4) Would you advise people to follow your career as a writer? I would advise people to “follow their bliss,” which is actually advice from the famous mythologist Joseph Campbell (one of my heroes). Follow what you love. It may not lead you to the greatest financial wealth or material prosperity . . . But, then again, I feel that each person has to decide what is most important. How do we define personally success? I decided long ago that I couldn’t live with myself if I didn’t throw every fiber of my soul into being a writer. Certainly, I was always writing . . . But there’s a difference between hiding in a dark corner and writing in secret and getting out there and putting everything you can into it! I am SO much happier now as a writer than I was when I had a “proper” career. And so many different doors have opened for me along the way. 5) (Sorry, I had to throw this in for my teacher wanted something that qualified as ‘having done enough research on the following person that is being interviewed’). As Kendra Kandlestar IV won many awards, namely the Mom’s Choice Award, CCBC selecion, and Reader Views Reviewer’s Choice award, which is far more, if you excuse me for saying so, awards than any of the other books in the series have gotten, why do you believe so? Yeesh, you’ve been tort—er TAUGHT by me at numerous writing camps and classes; you even know what I like to eat and don’t like to eat! I would say you’ve done your research. BUT, in any case, proper answer below . . .
Actually, my first book in the Kendra Kandlestar series had quite a few accolades as well, being recommended by the Canadian Toy Testing Council, winning the Mom’s Choice Award, and being nominated for the Surrey Book of the Year award. Why The Crack in Kazah has ended up garnering so many awards is a pleasant surprise to me—I’m so happy that a fourth book in a series can win these awards, because it just means that the series hasn’t become repetitive or stale. I took a risk in writing that book, making it very different from the others and I suppose winning awards is ONE proof that my approach worked. (Though, the best proof would be reader response. MOST readers seem pleased with it). I’m not sure Crack in Kazah is my best book . . . It’s hard for me to be objective about it. The book I’m working on right now, the final installment of Kendra Kandlestar, is my favourite—just because I’m in the middle of it and I am enjoying what is happening with the characters. Here’s the latest page from my Kendra Kandlestar sketchbook, the place that captures all of my ideas, musings, and inspirations for the final installment in the series. 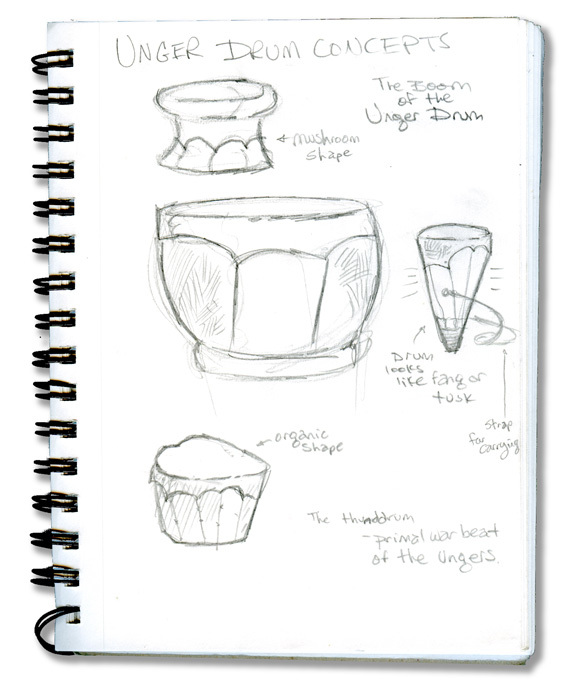 These are just some my ideas as to what Unger drums might look like. You see, drumming is an important part of the cultural fabric of the Unger tribes—and it will also be a key component of the plot of the book. At one point, the Unger hunters will issue “the thunndrum” for one of the Een characters (I bet you can’t guess which one!). The thunddrum, also known as the “thunder beat,” is the beat the Ungers traditionally play while on the hunt, in pursuit of particularly dangerous prey. And to play the thunddrum means to show no mercy for the target. I was actually inspired to develop this part of Unger culture after participating in a few drumming circles this past year. It’s a wonderfully liberating activity and while I was playing my traditional African drum (called a djembe), my mind drifted off and I suddenly found myself standing amidst an entire sea of Ungers, banging on their instruments as they prepared to wage war on the Land of Een. I haven’t written this actual scene yet . . . but I have a feeling it will appear on the page almost exactly as it appeared in my imagination while in the drumming circle. We’ll have to see . . .
That’s the way the The Storm Crow Tavern in Vancouver describes itself. Or, as my friend James McCann says, “A sports bar for nerds.” But no matter how you describe it, The Storm Crow has become the new favourite meeting place for my circle of creative friends. 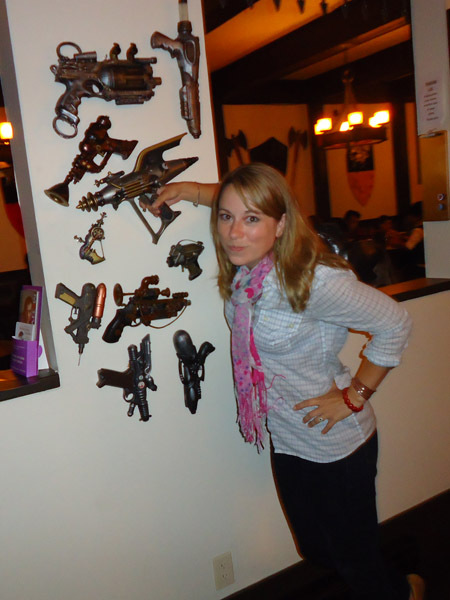 Maybe it’s the cool display of ray gun props. Or the collection of Dungeons & Dragons manuals. Or the big-screen TV showing classic sci-fi movies (anyone remember Zardoz?). Or the fact that the server was wearing Elf ears (at least I assume she was wearing them). Or the poster to enlist in the fight against the Cylon army that was hanging in the bathroom. Or . . . well, I could go on and on. In any case, I think you get the idea: this place is heaven for a person who spends most of his day writing about Eens and Ungers! If you find yourself in Vancouver, make sure you check it out (but not too many of you; I don’t want to have to line-up to get in!). Because today is the last day for the promotion running on amazon for Kendra Kandlestar and the Shard from Greeve (click here for details) I thought I’d post some of the background work I did for one of the characters that was introduced in that book: Prince Peryton. The peryton has long been my favourite mythical creature and I always knew I wanted to give it a starring role in one of my books. The perfect opportunity came in The Shard from Greeve. 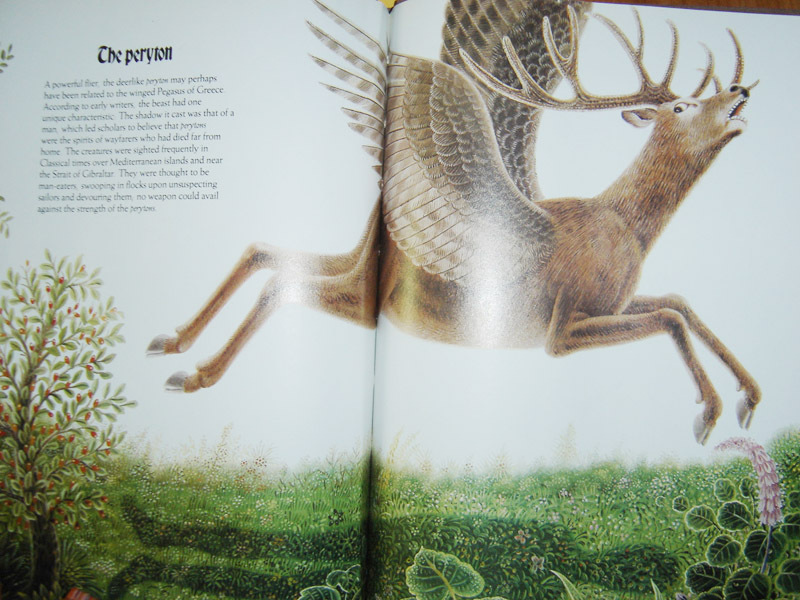 As you can see in this beautiful illustration, the peryton is traditionally depicted as casting the shadow of a man. Some stories say that perytons ate humans, or that they were even involved in the fall of the Roman Empire. This profile dates back to 2008, so reflects my initial thoughts for this character. Many things changed as I wrote the book! 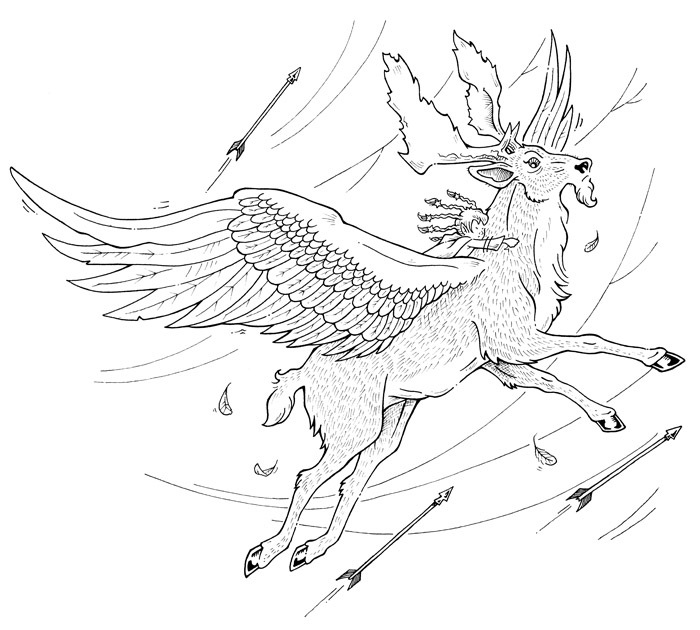 For instance, on the sketch it says that the peryton’s antlers would be cut off by Queen Krake—if you’ve read The Shard from Greeve, you know that the peryton does indeed lose his antlers, but it’s someone else who is responsible. 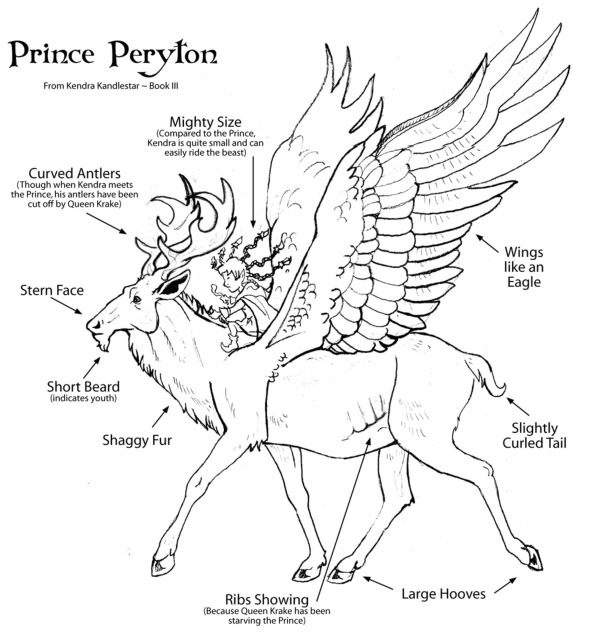 Also, you’ll see that the peryton has a secret name that he doesn’t tell anyone. 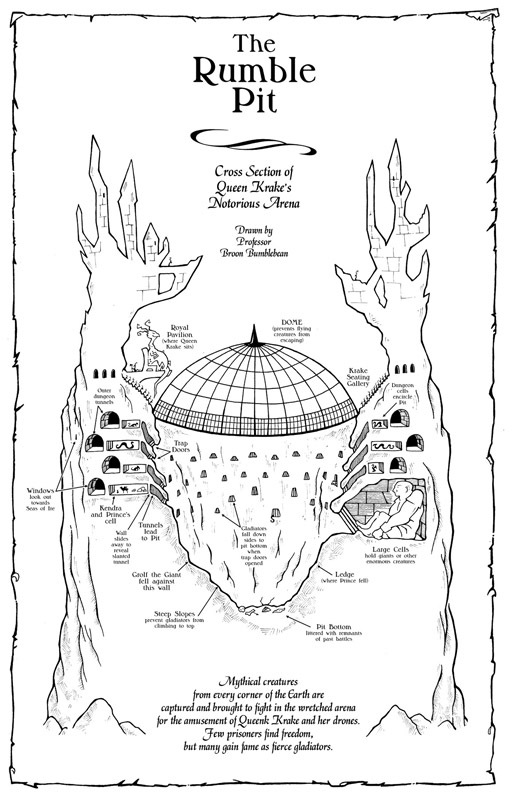 Kendra eventually will learn it in Shard, though it’s not revealed to readers until Book 4, The Crack in Kazah. (And even then, you have to pay close attention!) 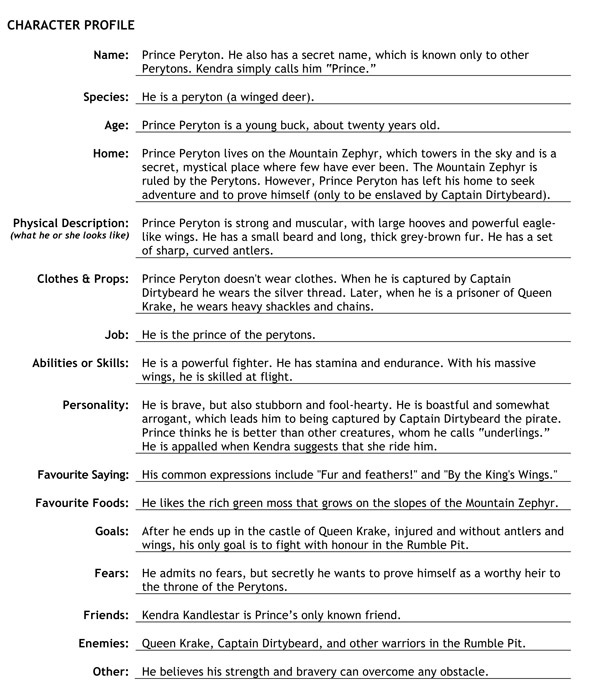 Mostly, Kendra just calls him “Prince” since he is of the royal peryton family from Mount Zephyr. The visual look of the peryton also evolved. Originally, I drew him as a very sturdy, robust character, and then decided I wanted him to be younger and slightly more sleek, as seen in this final illustration from Shard . . . Prince does make an important appearance in Crack in Kazah. Will he appear in Book 5, the Kendra Kandlestar installment? Actually, I will admit that this is something that I don’t even know yet! 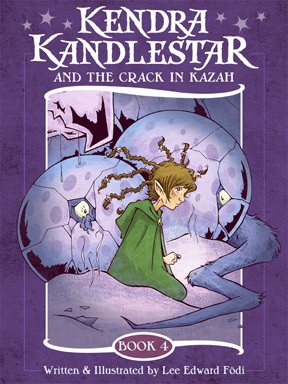 Given that there is a promotion running this week on amazon for Kendra Kandlestar and the Shard from Greeve (click here for details), I’ve been reflecting on the creation of that book. 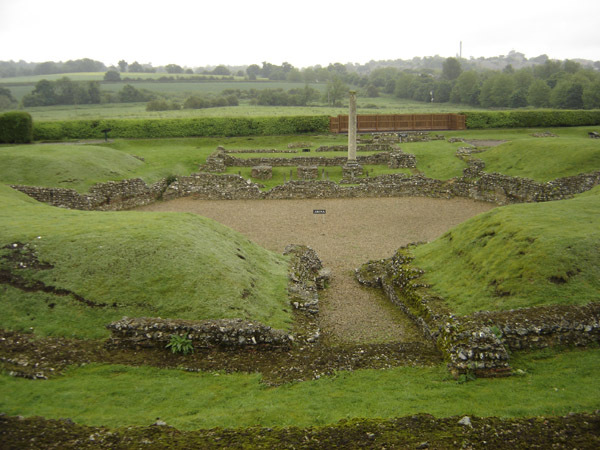 Yesterday, I wrote a post on my inspiration for the Rumble Pit itself—that dastardly gladiator arena where different mythical creatures are forced to fight for survival. I had a lot of fun thinking about which characters old and new would end up in the Rumble Pit. Many of the “rumblers” were only mentioned by name, or shown with an illustration, but the truth is that I had developed little mini back-stories for each of them. I like to think that many of them could have novels all to themselves, chronicling how they ended up in the gladiator trenches. The truly fun part was that so many of the rumblers had completely different motivations. Here are my favorite rumblers . . . whom would you choose to fight by your side? Since this week there is a promotion for the Kendra Kandlestar and the Shard from Greeve on amazon, I thought I would delve into my archives and show some of the research that I did for this book. As many of you know, the Shard of Greeve involves a gladiator arena. So, back in 2008 when I was working on this book, I really wanted to make my way to Rome to check out the Coliseum. 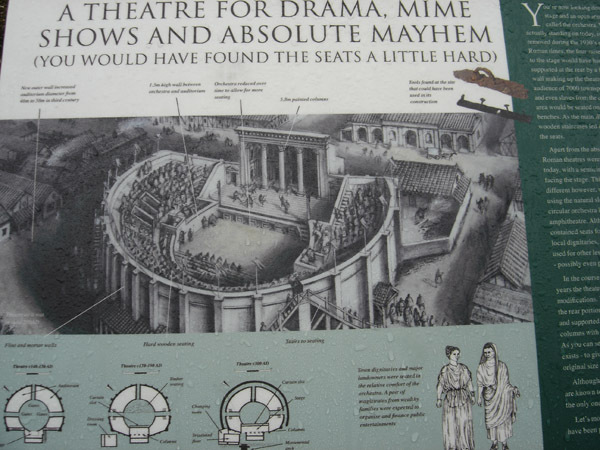 I just couldn’t make it—but, as luck would have it, I found myself in England that summer and was delighted to find the ruins of a theatre in the old Roman town of Verulamium, located at St. Alban’s, just north of London. So, one rainy afternoon I trudged across the soggy soil and check out the site. It’s pretty humble in comparison to the Coliseum, but no one else was there, so I was really given an opportunity to breathe in the air, to trod the ground, and to simply try and let imagination take me back to the time when the arena was fully functioning. Still, I found the ruins fascinating. There were areas for seating, performance, and for preparation, all of which informed my designs for the Rumble Pit in my book. 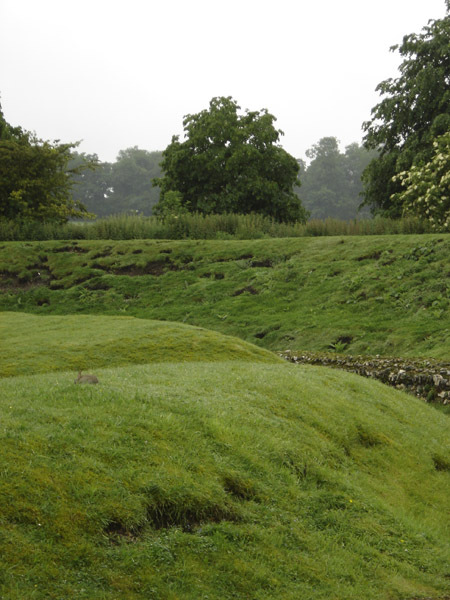 The arena at Verulamium was not only for theatrical performance. It was apparently a full-functioning gladiator arena, just on a miniature scale. According to the literature I read at the site, they even shipped in lions from Africa to participate in the grisly affairs. These little guys were everywhere—and they somewhat dampened my experience, only because here I was, trying to imagine myself amidst a chaotic battle filled with roars and shrieks, and then . . . boing, boing, boing! This is the last of the ingredients I have to show (at least for now) of my revamped magic potions kit that I use in my creative writing classes. True, I showed clippings from a winged horse earlier in this series, but these are from your more exotic creatures: Griffin, Phoenix, and Cockatrice. These are good to drop into your potion at the very last moment (not that my students ever listen to me on this account). I will admit these are three of my favourite creatures—they make appearances from time to time in my Kendra Kandlestar series. In The Shard from Greeve (which is being offered for FREE on amazon until September 25th by the way! ), Kendra finds herself in the midst of a few critter brawls. I’m still on the hunt for a few more ingredients to go into the kit: Goblin eyes and tail hair from a centaur. So far no luck. The hunt continues!